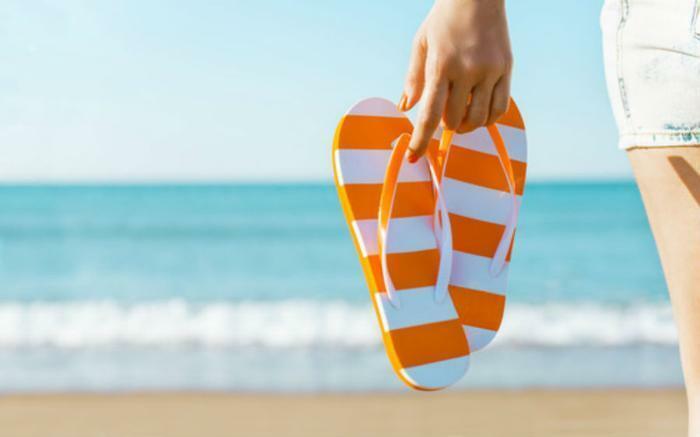 Flip-flops are the go-to shoe for many during the summer, but the flat-soled footwear can be hazardous to the health of its wearer, experts say. While you don’t have to banish them from your wardrobe completely, you may want to avoid wearing flip-flops for too long or for the wrong activity. “This time of year I frequently see patients with foot conditions related to wearing flip-flops,” said Christina S. Long, a podiatrist and foot and ankle surgeon at Wake Forest Baptist Medical Center. Because they offer little in the way of arch or heel support, flip flops can cause injuries including stress fractures, muscle pains, tendonitis, arch pain, and heel pain. Wearers are also more susceptible to cuts, bruises, torn nails, insect bites, and sunburn. Clumsiness is another potential pitfall, since it’s relatively easy to trip and fall while donning the slippery shoe. “Wearing flip-flops is better than going barefoot because they do provide some protection for the bottoms of your feet, but that’s about it,” said Long. Consider leaving the flip flops at home when walking long distances, running, working in the yard, or standing for extended periods of time. You might also want to go with another shoe for driving, as flip-flops can easily get wedged between the pedal and floor. Sandals are a better “open-air” shoe choice, says Long, especially if they have a sturdy sole with some arch support, a short heel, a wide strap over the top of the foot and a back strap to keep the heel in touch with the sole. But for optimal arch support, your best bet is a closed-in tennis shoe or sneaker. Not too flimsy. Gently bend the flip-flop from end to end ensuring that it bends at the ball of the foot. No shoe should fold in half. High-quality leather. To minimize the potential for blisters and irritation, choose flip-flops made of soft, high-quality leather. Proper fit. Make sure your foot doesn’t hang off the edge of the flip-flop. All your shoes should be slightly longer and wider than your feet, says the APMA.